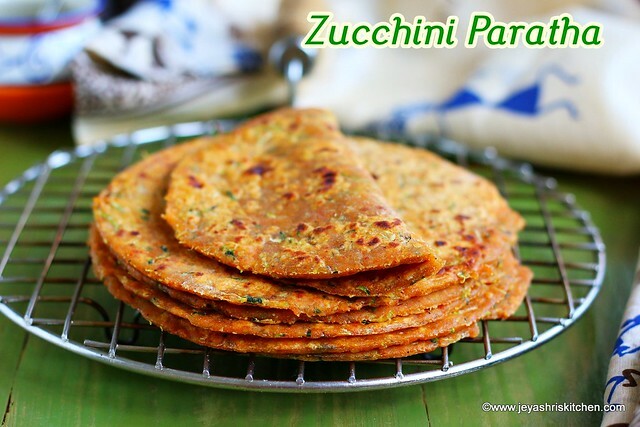 Zucchini paratha with step by step picture, no onion no garlic paratha recipe, an easy to make Indian flat bread. I usually make it by squeezing the excess water from the vegetable and add it to the atta and make the dough. Recently when i visited my friend's place for lunch, she made lauki paratha. She told she made it just by adding the lauki into the flour, without squeezing the extra water. It was very soft and it tasted so yum. I just casually tried the same with zucchini last Sunday for breakfast. It turned out very well. I realised the key is to just add very few drops of water to the dough, which helps in making a non sticky dough. Since it is a no onion no garlic paratha recipe, i thought i will share this during this time. Check out our Complete collection of No onion no garlic recipes. 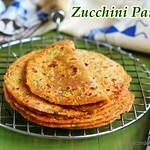 Description: Zucchini paratha, no onion no garlic paratha recipe, an easy to make Indian flat bread. Grate the zucchini, i used the small hole ones. In a wide bowl add the whole wheat flour, grated zucchini, besan flour, cumin seeds, red chili powder, amchoor powder, garam masala and salt. The Zucchini will ooze out water so just add very few drops of water to this. Knead the dough and add 3 tsp of oil. If you feel the dough is sticky, add 1-2 tblsp of flour to this. Immediately start making the paratha. If you leave it for sometime, it will ooze out more water. Make the dough into equal big lemon sized balls. I used plain flour for dusting. It is purely optional. If you are comfortable dusting with atta, as we do for chapathis it is fine. I recently started using plain flour for dusting these type of sticky parathas, and it rolls up so well. Dust the dough ball in flour and roll it into a medium sized paratha. I used a plate to cut them into perfect roundels. Heat a tawa and cook the zucchini paratha on both sides. Smear few drops of oil. Repeat the same for the rest of the dough. Do not add water to the dough, mix it well and just add few drop of water only if needed. Zucchini can be replaced with radish or bottle gourd. You can add few finely chopped coriander leaves or mint leaves. 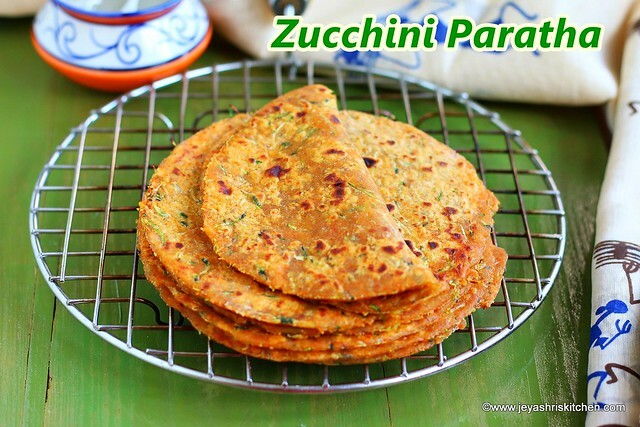 Zucchini paratha is perfect for kids lunch box too.